Christmas Morning Coffee & Cranberry Pistachio Biscotti - Home. Made. Interest. 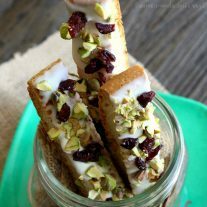 This easy Cranberry and Pistachio Biscotti recipe can be made ahead of time and is coated in white chocolate, dried cranberries, and pistachios. Perfect with Christmas morning coffee! Can you believe it is already time to start thinking about Christmas? Where has the year gone?! From now until the new year it’s a flurry of activities, school programs, cookie exchanges, and dinner parties. I love it all but as much as I enjoy entertaining in the end my favorite part will always be Christmas morning. It’s all about family and it’s even more special now that I have kids of my own. Of course as you all know when you have kids Christmas morning starts early…I mean REALLY early. My kids are usually coming into my room and asking when they can go downstairs by 6 a.m. (if I’m lucky and they sleep that long). But, Christmas only comes once a year so my husband and I are good sports and roll out of bed and head downstairs. 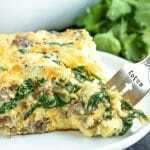 The night before Christmas I usually make a breakfast casserole of some sort, like my sausage and egg breakfast casserole or my Gruyère, ham and spinach strata so I can pop that in the oven to heat up while we open stockings but, before I get that far mommy and daddy have to have their coffee! 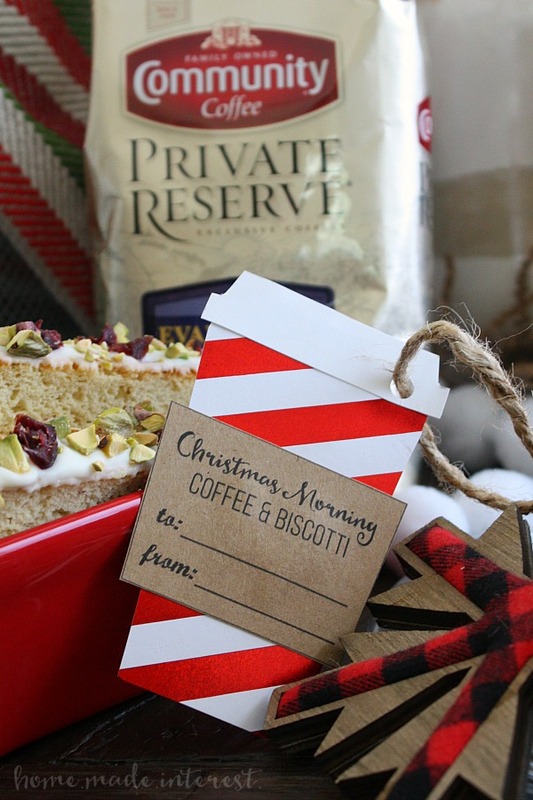 Special days deserve special coffee and that means Community® Private Reserve® coffee. If you haven’t heard of the Community Coffee Company before they have a great story. They were founded in 1919 and they are the largest family-owned and operated retail coffee brand in America. 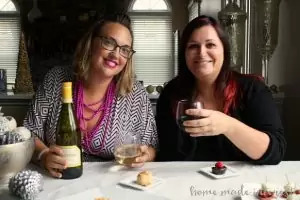 Four generations of the Saurage family have operated the company since it was created. That’s pretty amazing! They are dedicated to quality products importing, roasting and distributing the highest-quality premium coffees and teas, using only 100% Arabica coffee beans. Their Private Reserve® coffees are an exclusive collection of blends and single-origin coffees made from 100% specialty-grade Arabica coffee. I personally love the Founder’s Blend it’s a special blend in honor of the company’s founder, Cap Saurage. It’s a medium-dark roast blend of coffee from South America, Africa and Brazil, and it fills the house with a heavenly smell as it is brewing. Of course we can’t live on coffee alone so as a Christmas morning treat this year I’ll be drinking my coffee along with homemade Cranberry Pistachio Biscotti. I just learned how to bake my own biscotti recently and I can’t believe how simple it is. 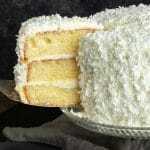 You mix together flour, sugar, baking powder, a pinch of salt, eggs, and vanilla extract until it forms a dough. Then, for almond biscotti, you add some slivered almonds. You divide the dough into two pieces and form them into loaves that are about 2-3 inches wide and 3/4 – inch tall. 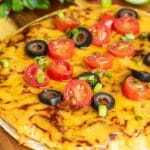 The dough bakes and when it comes out of the oven you cut it diagonally into slices. The special thing about biscotti is that you bake it a second time to give it a great crunch. So back in the oven it goes for another 15 minutes. You can eat biscotti just like that or you can making it extra special by topping it with different chocolate and add-ons. I wanted something that felt Christmas-y so I dipped the flat portion of my biscotti into melted white chocolate then sprinkled it with chopped pistachios and dried cranberries. It’s a beautiful, simple treat that goes perfectly with your Christmas morning coffee! 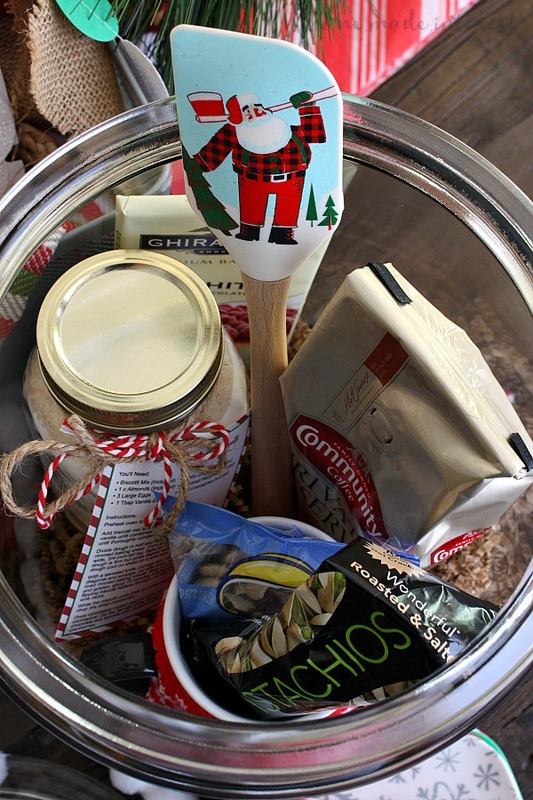 I love my Christmas morning coffee and biscotti so much that I made it into this easy gift basket to give to a few of my coffee loving friends. 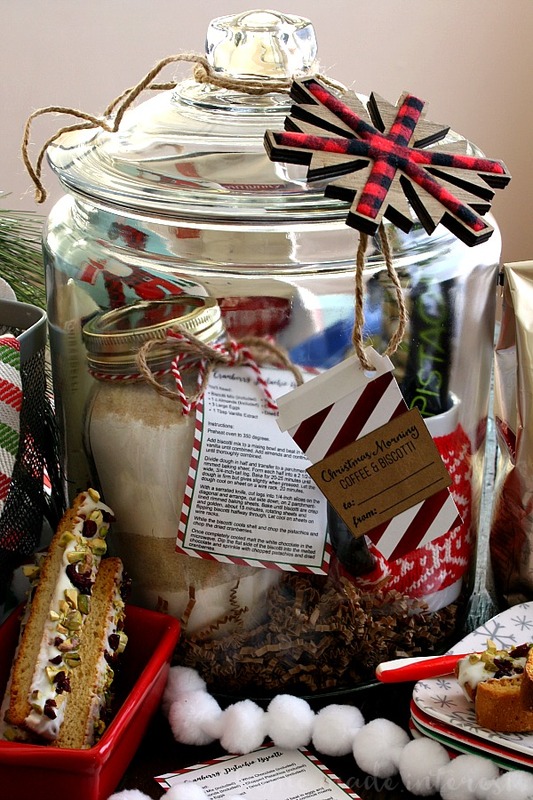 It’s filled with homemade biscotti mix and instuctions, white chocolate, pistachios, dried cranberries, Community® Private Reserve® Founder’s Blend coffee, an adorable coffee mug with a sweater koozie, and a Christmas spatula for mixing everything up. 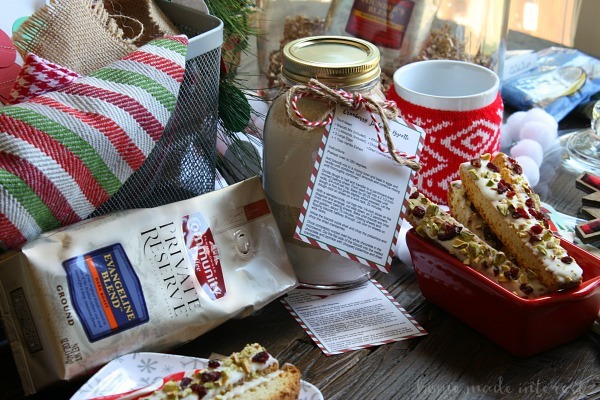 I put all of the pieces inside of a simple glass jar that can be used for storing the biscotti after you bake it, and finished it off with a beautiful rustic snowflake and a simple but super cute coffee gift tag. 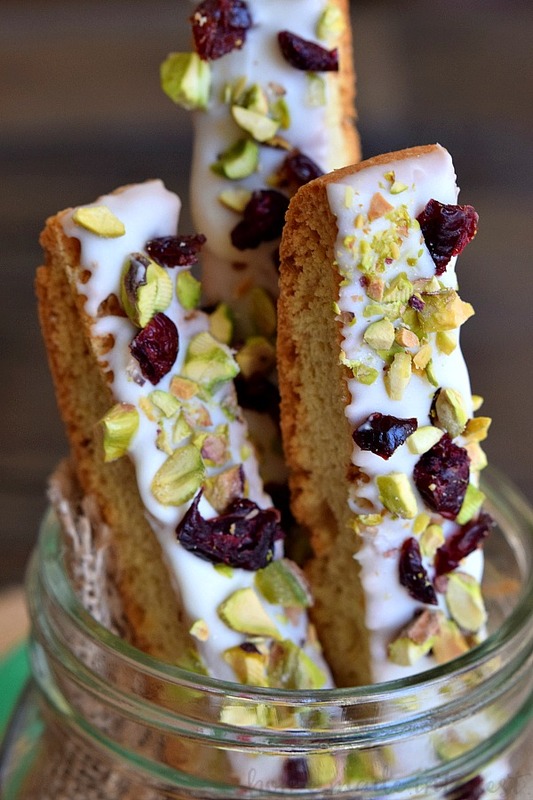 This Cranberry Pistachio Biscotti is a sweet Italian cookie that is perfect for Christmas morning. Add biscotti mix to a mixing bowl and beat in eggs and vanilla until combined. 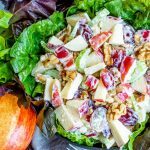 Add almonds and continue mixing until thoroughly combined. 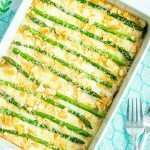 Divide dough in half and place it on a parchment-lined baking sheet. You may need to bake it in batches depending on the size of your baking sheet. Form each half into a 2-3 inch-wide log that is about 3/4-inch-tall. Bake for 20-25 minutes until the dough is firm but still has a little bit of give when you press on it. Once it is done baking let the dough cool for 30 minutes. Then using a serrated knife cut the log diagonally into 1/2-inch wide slices. Place the slices back on a parchment paper lined baking sheet and bake for another 7 minutes on each side until they are crisp. Remove from oven and let cool. While the biscotti cools chop up the chocolate and melt it in the microwave heating it for 15 seconds at a time until it is smooth. Once the biscotti has cooled dip the flat edge (the bottom when it was baking) into the chocolate and then sprinkle with cranberries and pistachios. Let the chocolate firm up and then you're ready to enjoy! Note: You can store these in an airtight container for 3-4 days. 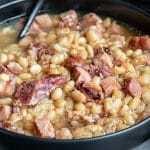 If you are making them ahead of time you can store them in an airtight container in the freezer for 2 months. I love making biscotti! I discovered how easy it was a few years ago as well. 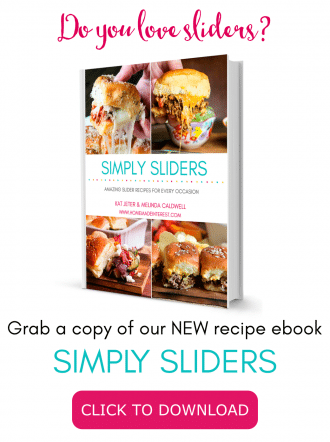 I am saving this recipe and making these. They look so festive!